If you want to know more about the PACKA53 portable swamp (evaporative) cooler from Kuulaire, this definitive, detailed review covers all the bases! I have taken this unit and looked at it in fine detail, leaving no stone unturned. Before I get into the machine with a fine tooth comb, I want to ask you two things: Why do you want a swamp cooler and why are you interested in this model? The most important first thing I'm sure you are already aware of is: This is NOT an air conditioner and if you live in a humid climate, it will NOT work very well and may bring disappointment. I'll assume you live in a sufficiently dry climate to use one of these coolers and get the max from it. So now let's take an overview look at what you'll be getting when you purchase this machine. The first thing that will pleasantly surprise you when you take delivery of this appliance and get it out of its box is the very obvious fact that it is all in one piece, ready assembled and ready to use. Many cheaper coolers in this class get delivered in several bits and need to be assembled by the owner. So you get it out of the box and spend a few minutes reading through the well laid out manual to familiarize yourself with how it works and anything you need to know before you turn it on. You'll want to look the unit over and familiarize yourself with the controls on the top as well as the remote, which is a pretty simple device that will control off/on, speed settings, air distribution and the eight-hour timer. Take a look around the back of the unit. 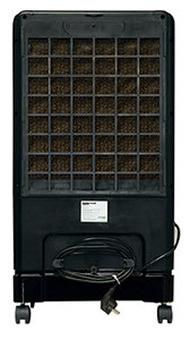 The large mesh at the back is the cooling media through which room temperature air is drawn into the unit. It can be easily removed for cleaning and removing dust to prolong its useful life. Please note the rear mesh should never be covered with cloth or anything that might reduce the air flow or obstruct the cooling process. You'll also notice the power cord can be wrapped around the cord wrapper low down on the rear body to keep it tidy. On the side of the unit you'll see the pullout filler for the water tank and see how easy it is to fill when necessary. There is also a water flow control that you can set to "Max" when the air is very dry or to "Min" when there is some moisture in the air (or anywhere in between). Around the front, you'll notice a slot low down that allows you to see at a glance the water level. That way you'll know when to refill it without having to open it up. The top half contains the horizontal louvers which can be manually set to control vertical airflow. Behind them you'll see the vertical louvers which will oscillate when set (there is a button on top for this setting) to provide left to right airflow. Just so you know, this model is ETL rated and very cost efficient. So let's dig into the machine and see what we can find! A good place to start is to fill the tank with water, which will take up to four gallons of regular tap water. Then let it stand for a minute or two to allow the cooling media to soak up the moisture until it's saturated. Next, plug it into a convenient mains outlet, set it on its low speed setting and turn it on. Right away you'll be able to feel the chilled air coming out the front of the unit and even on the low setting it's pretty forceful up close! That's really all there is to it with regards to using the unit. It's really easy to use and no hassle at all and with the remote control, you don't even need to get out of your chair to alter the settings or turn it off or on! How Does the PACKA53 Cool the Air? 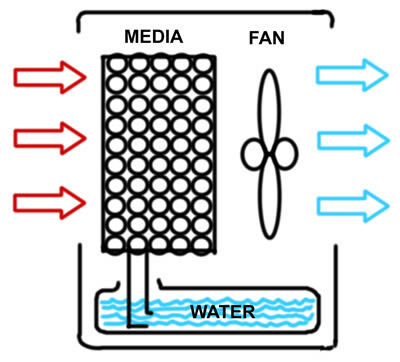 To graphically show you exactly how this unit cools the air that flows through it, I have provided my own diagram below. You'll see how warm air enters the unit from the back (red arrows) and is drawn through the cooling media by the fan, which then forces the chilled air out the front of the unit (blue arrows). The cooling media is simply a rigid, absorbent pad that is specially designed to rapidly soak up the water directly from the tank below. It dos that continuously as the unit is operating so it can never dry out as long as there is water in the tank below. That means there is no need for a water pump, which is something that is found on many other units in this class. Pumps can break down occasionally, but since this unit doesn't need one, that's one less thing you need to be concerned about! Another upside to not needing a pump is that this unit will use even less power (pumps use up electricity to operate) than comparable units. 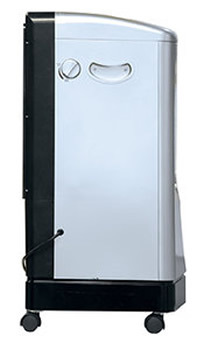 That makes the PACK53A one of the most economical swamp coolers in its class! Does the Kuulaire PACKA53 Work Outdoors? Sure it does! If you're spending some time on your porch or patio, say with some friends or the family during summer and you want to take the edge off the heat, this unit is the perfect solution! Just wheel it out there, plug it into the house current via an extension cord, have it filled with water and you're good to go. You can enjoy a meal outside with a great cool breeze to keep things comfortable and the unit runs for pennies per day! There are many applications outdoors as well as indoors for this appliance. Outside, you can put it on a porch, patio, terrace or by the pool for spot cooling. You can place it under a gazebo or awning to keep you fresh and cool while you sit and read a book and relax. You can use it in a garden shed while you work with your plant pots. You can place it inside a summer house for the kids or even in a tree house if you have a long extension cable! Of course, it's a great way to keep your workshop or garage cool while you work or like to retreat to your favorite space to be alone in comfort. You can even use it in a greenhouse if it's getting too hot in there and your prize plants are wilting! Indoors it's a great way to cool a room up to 325 square feet by as much as 25 degrees. You can use it in any room or home office and when you're done in one room, simply unplug it and wheel it into the next room. It goes wherever you go! There are several other models in the range by Kuulaire that have slightly different specifications and work best in a variety of environments that they are specially designed for. All models come ready assembled for your convenience and so can be operated right out of the box. This is a larger unit with a big, generous cooling capacity of 350 square foot and a 475 CFM (Cubic Feet per Minute) air flow capacity. A huge 5 gallon water tank supplies the moisture for this big machine to push out a huge amount of chilled air. 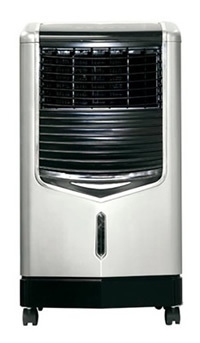 It comes with a water flow control, three cooling speeds, swing louvers, a timer and remote. It works as well outdoors as it does inside, making it a highly versatile and useful appliance for keeping you and your family cool when the weather turns hot. (Pictured right) This is a slightly smaller, lighter unit with a cooling capacity of just 175 square feet. It's perfect for smaller rooms and can also be used outdoors. There is an 8 hour timer, 4 gallon water tank, water flow control, swing louvers, remote and it weighs in at only 16 pounds. You can buy this great cooler online from Amazon right now for a great price and with free delivery (Some limitations apply: Check on the Amazon website for details) when you click on the image right. Similar to the PACKA43, this small unit will cool a space of up to 175 square feet, has a 4 gallon tank (but no water flow control) and a 9 hour timer plus remote. It weighs only 15.7 pounds. There are three speed settings and swing louvers for wide air distribution. This is the baby unit and is fine for small rooms of up to 125 square feet. It has a smaller 3 gallon tank and is the lightest of the models, at only 14 pounds. It has a 9 hour timer, three speed settings and a water flow control, low water alarm, swing louvers and remote. Power consumption is just a frugal 70 watts! 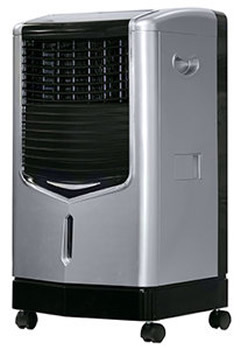 This is a monster made by Portacool (they make Kuulaire products) but I decided to include it in case you were looking for a high powered evaporative cooler that could handle a larger space. This machine will cool a space up to 700 square feet and drop the temperature by as much as 30 degrees. A massive 15 gallon tank supplies enough water to keep the unit running at full blast for several hours, although it is recommended you hook it up to a hose for continuous running. There is a two speed fan and adjustable louvers to direct the wind vertically but you have to physically turn the machine to get the horizontal air where you need it. It's a big appliance meant for doing a big job of cooling a big space. If that's what you need, then this USA made appliance is the one for you! Will You Buy One of These Coolers? So that's where I'm going to leave it for this model's review and its same manufacturer alternatives. If you decide you want to buy the device (or one of the others) there is a handy link to Amazon where you can get the one you want for a great price and take advantage of their free shipping deal. In addition, you have the surety of knowing there is an easy returns policy, if it becomes necessary. However, I hope that won't be needed since you know exactly what kind of a cooler this is and what you'll be getting for your money. But if it happens there's a defect or any problem at all, you know you're in safe hands and there will be no problem returning for a full refund or a replacement unit.